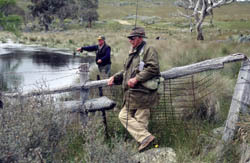 Call the landowner before setting out, identify yourself as a member of Rod Fishers, and ask permission to fish. Leave a contact telephone number. Call in at the landholder’s house on arrival and departure. If contact can’t be made, fish elsewhere. Don’t fish uninvited. Always be courteous. Ask the landowner whether they would like a fish for the table (unless they request catch-and-release). Leave gates the way you find them. Don’t drive unnecessarily across paddocks. Minimise disturbance of livestock. Report damage or distressed stock. Don’t take your dog, don’t leave rubbish and don’t light fires. Leave room on the stream for other fishers and share the pools. Respect others including those using bait and lures. Work out a way to fish alternate pools or areas. Do not disturb trout by visible movement near other fishers. There are many factors that influence the necessity and effectiveness of catch-and-release. Marginal trout fisheries are more affected by seasonal and climatic variations than any other factor. 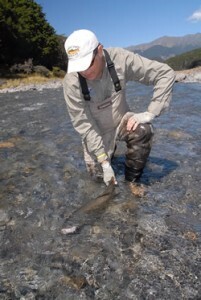 Releasing fish is not necessarily a remedy for poor fish populations. Some streams may benefit from sensible culling of small fish. Older fish are often the most productive in breeding terms. Play and land fish quickly to avoid harm and distress and handle the fish as little as possible. Selective harvesting of large fish from stocked impoundments can allow less dominant fish to develop into prime specimens but exceptions may apply. Some impoundments impose conditions that must be complied with.